It’s important to gut load Dubia roaches for the health of the animals that eat them. Nutrition gaps are very common among captive insectivorous animals, and this can lead to problems like stress from environmental and nutritional inadequacy, general decline, and even acute illness. Gut loading can address these issues to the extent that it helps close the nutrition gaps common to captive exotic animals. In this day and age, gutloading is just something most reptile, amphibian, and arachnid keepers understand that they should do. The good news is that gut loading requires relatively little effort when compared to the generous benefits it provides. All you need is care for the well-being of your pets, the right information, a little gut load, some Dubia roaches of course, and a willingness to make it happen. This article addresses what, why, and how to gut load Dubia roaches. Why gut load Dubia roaches? Gut loading is the practice of providing feeder insects with nutrients intended not for them, but for the animals that eat them. It’s done by feeding the insect foods that contain those nutrients, then feeding the insect to a reptile, amphibian, arachnid, or other insectivore. Simple. Gut loading is essentially an indirect way to get primary nutrition to your animal. When you feed off a gutloaded insect, its nutritional value is the insect itself plus whatever’s inside its stomach and intestines. Naturally the goal is to feed insects healthy fare that will benefit the animals that eat them. This may be a particular vitamin, mineral, or any number of macro or micro-nutrients, in any combination. It’s important to note that this is done exclusively for the benefit of the animals and without regard for the needs of the insect. Therefore, a gut load can be any substance that is good for an insectivore, even if it is bad for the insect itself. Because of this, gut loading is a short-run proposition. It’s not intended to provide nutrition for the insect at all. It may, and in practice it often does, but that’s not the intent. Instead, it’s meant to feed the animal directly. The purpose is to get (often plant-based) food and its nutrients into an (often carnivorous) animal in order to satisfy that animal’s nutritional needs. As such, gut loading is usually done a number of hours or even days before feeding. Most feeder insects digest what they eat within 24 hours, so the practical value of their gutload is measured by what they consumed the preceding hours rather than days. However, Dubia roaches are different, as you will see. They have a unique digestive system, and their gut-loading time can be extended to as many as three days. This has additional benefits for the animals that eat them. With respect to the predator animal and the balance of intrinsic (the insect) versus extrinsic (what it ate) nutritional value, gut loading is supplemental. It’s a way to get either additional nutrients to an animal, or nutrients that may be missing from its general diet. In either case, the insect is still the primary nutrient source. The food in its stomach is secondary. However, both are important. Perhaps not equally so, but there’s no need to choose one over the other. Dubia roaches allow you to do both to a greater degree than other feeder insects. While this dynamic clearly favors the predator, the relationship is still one of symbiosis rather than absolutes. Feeder nutrition is essential to keeping captive reptiles healthy. The same goes for amphibians, arachnids, and any other insectivore. Proper nutrition can prevent a decline in health. It can also help bring sick or stressed animals back to health. The key to feeder nutrition is (a) choosing a nutritious feeder then (b) loading its gut with healthy food. Being the most nutritious feeder insect doesn’t mean having all the nourishment your animals will ever need. It would be nice if this were true. However, as with most things, it’s not. Nutrition is complicated. So is the interplay between nutrition, diet, and health. As it stands, there is no single insect that meets all the dietary needs of every insectivore. Dubia roaches come closest to this ideal, but there’s still room for improvement via nutritional enhancement through gut loading. Calcium is a good example. Like all insects, the Dubia roach doesn’t have a skeleton, and its exoskeleton doesn’t contain calcium. Dubia roaches provide calcium, but it comes from their body rather than their exoskeleton. And importantly – assuming the animal that feeds on them has its own skeleton – the calcium from Dubia roaches is not enough to grow and maintain it. So then how do insectivores get enough calcium from insects in the wild? Part of the answer is that nature gut loads. Calcium comes from the ground. It is abundant in soil, compost, and vegetation. These are all things insects love to eat. Many or most of the insects eaten in the wild themselves ate in the previous 24 hours, and this is how insectivorous animals get their calcium. It’s also how they get other minerals and vitamins. In a sense, insects come gutloaded in nature. In addition to eating a bug and its lunch (and maybe its dinner too), wild animals also tend to eat a diverse diet. The variety of prey they encounter in nature is far greater than what is practical in captivity. This is another way animals in the wild meet their nutritional needs. Dietary diversity keeps them healthy while dietary monotony in captivity is a reason to gut load. And many herp keepers do. As a group, they put significant effort into replicating their animal’s native habitat, but the natural diet of exotic animals is usually very difficult to imitate. It’s just not feasible to provide an insect buffet of ten or twenty different exotic species. While replicating a captive insectivore’s natural diet may not be doable for most people, feeding them gut loaded Dubia roaches is. Dietary diversity can be replicated by (1) choosing Dubia roaches as a primary feeder, (2) supplementing with occasional treats for variety, and (3) gut loading. In case you need more convincing, Merck veterinary manuals considers nutritional supplementation a “must” for amphibians (external link), and “required” for reptiles (external link). They point to two forms of supplementation: gut loading and dusting. We agree that dusting is beneficial, but dusting is different from gut loading. We’ll cover dusting in another article. Another reason to gut load Dubia roaches is their inherent gut-loadability. As it stands, Dubia roaches are unique in their capacity to keep food in their belly for up to three days. So (a) the volume of matter in their guts may be greater than that of other gut-loaded insects on a per-weight basis, and (b) what’s there is likely in various states of digestion. The first part is important because more gut load equals more nutrition. This is up to a point, of course. The second part is also very interesting and may be significant. The nutritional profile of plant matter differs according to its stage of digestion. Different digestive stages provide different nutrients even for the same food over time. There isn’t much research on this, but it’s something scientists are looking into and something worth considering. This leads to yet another reason to gut load Dubia roaches, which is that they can digest plant matter other feeder insects can’t. Roaches can digest plant fibers with the help of specialized bacteria in their guts. This means roaches have access to nutrients carnivorous animals on their own don’t (external link). The only way insectivores can get these nutrients is to eat the roach, or perhaps something else. It’s reasonable to suggest that at least some nutrients unlocked by roaches are required for good health. How much of an insectivorous animal’s health depends on these nutrients is unknown, but the idea goes back to evolution and dietary diversity. The inter-dependency among predator and prey makes sense, and it’s a common relationship found throughout nature. The bottom line is that captive insectivorous animals living outside their natural habitat and eating insects other than their natural prey need nutritional supplementation to achieve full health. Dubia roaches are super-nutritious, but we still advise supplementation. Gut loading Dubia roaches with nutrient dense plant foods should be done at least occasionally, but preferably often. Gut loading Dubia roaches is easy. At its most basic level you could simply throw in some fruits or vegetables and call it done. This is one way to go, and your animals may be better off for having done it. However, haphazard gut loading may leave something on the table. You could do more and your animals might be healthier if you did. You can avoid this missed opportunity by learning from our experience below. Read on if this sounds like a good idea. The following are some basic steps to gutloading. They are fairly self-explanatory. You will find general guidelines, specific reasons, and some things that are good to know. Everything below is anecdotal, which is to say it’s based on our own experience and the experiences of others. First, decide what you want to accomplish and why. The practice of gut loading can be divided into two categories. We call them “specific” and “general”. The two overlap some but they are separated by how an insect is gut loaded, with what (to some degree), and for what purpose. General gut loading involves feeding the roaches foods considered “generally healthy” for the target animal. These might include any number of fruits or vegetables containing a wide range of essential macro and micro-nutrients. Examples include (but are not limited to) carotenoids, carbohydrates, calcium, and vitamin C. These are all nutrients animals need in some quantity depending on the species, their diet, their environment, etc. The goal of general gut loading is the reliable, long-term provision of basic nutrition via healthy feeder insects (the roach) supplemented with whole plant foods (the gut load). Examples include any number of grains, vegetables, and fruits. Dubia roaches particularly enjoy apples, oranges, and bananas. They also really like sweet potatoes, beets, and carrots. These foods are excellent general gut loads because they contain basic nutrients animals need, and because and they’re available in most supermarkets throughout the year. The key is to find something that works for you and your animals, then provide it consistently. This might include a single food or two, or you could mix it up occasionally. How you proceed is entirely up to you. The key words again are “healthy” and “reliable”. At this point it’s worth mentioning that organic foods – particularly fruits and vegetables – are the safest choice for gut loading. Pesticide exposure from conventional produce may not kill an animal, but it probably causes at least some degree of metabolic stress. How much stress and what impact that has on the animal may depend on the species, its relative health, and other factors specific to your unique situation. This goes to the purpose of gut loading, which is nutritional support. You don’t want to defeat that purpose. Whether or not you end up going organic is your choice, but we wanted to let you know it’s an option and why it might matter. The alternative to “general gut loading” is specific or targeted gut loading. The two are very similar. For example, general and specific gut loading often include the same foods. However, they differ in important ways. Intent and approach are probably the most obvious. Specific gut loading involves feeding the roaches foods that contain certain nutrients for a specific reason. One example could be carotenoids (that would provide vitamin A) to address an animal’s existing eye issue. Or it could be that a particular species is prone to developing eye issues, so a gut load can target carotenoids to help prevent eye problems from developing. Any nutrient or micro-nutrient can be targeted in specific gut loading. It could be carotenes for vitamin A, vitamin C, or any other vitamin. It could be foods with high iron or calcium, or foods with low iron or calcium. Specific gut loading is for animals with a nutritional deficiency, animals that may be prone to a particular deficiency due to species or situation, or animals that may simply benefit from an additional boost (or reduction) of one nutrient or another. After deciding what you’re doing and why, the next step is figuring out what foods to use. Dubia aren’t particularly finicky eaters but they do have preferences. To maximize your efforts, look for foods that achieve your objectives for your animals, and that the roaches also like. Food they only mildly enjoy won’t be a “failure”, but like haphazard gut loading, they may leave something on the table. The effort won’t be as successful as one where the roaches love a food so much they fill their bellies to capacity. This is obviously what you want them to do. Foods that are good for specific gut loading that Dubia roaches have a taste for include: apples, bananas, beets, broccoli, carrots, oranges, squash, sweet potato, various cooked grains like oats, wheat, and rice, and zucchini. Of course, you can also create your own concoction of food and added vitamins or minerals that you may want to provide to your animals in higher amounts than any foods naturally contain. With this approach you may run into a situation where the roaches don’t like what you’ve fed them. Don’t worry if this happens. There’s a trick to getting Dubia roaches to eat a gut load they don’t like. The trick is to mix it with some fruit, sugar or bread. Dubia roaches love sugar. They also love yeast. While neither sugar nor yeast will contribute much to the quality of the gut load, they serve a purpose. Just use them sparingly. It doesn’t take much sugar to get Dubia roaches interested. And you could try both sugar AND yeast. Let the mix sit in a warm, dark place for an hour or so and the yeast will consume some of the sugar. While table sugar works, whole fruit is probably a better option because it contains vitamins and minerals. In our experience, fruits (except citrus) can be added to a gut load in any amount without negative consequences. Use citrus fruits with caution. Whether or not citrus is part of your gutloading depends on the animals that will ultimately consume the insects. We’ve seen and heard that some reptiles, for example, are not at all impacted by citrus fruit while others are. That might be something to consider researching, with your particular situation in mind. While almost everything is fair game, there are a few foods that you should gut load with caution, sparingly, or not at all. These recommendations are based on our own observations. While we’re fairly confident in what we’ve seen, your mileage may vary. We don’t know if our list is exhaustive. There may be things we haven’t tried that should be added to this list. Don’t gut load with beans. We’ve noticed that beans may have potentially negative effects on both roaches and the animals that eat them. Beans are protein-rich, full of nutrition, and healthy for humans, but they may not be quite as healthy for insects or herps. We don’t have more information on this. It’s just something we’ve noticed. Maybe it’s the lectins, which are part of a plant’s natural protection against being eaten. Humans have evolved ways of dealing with lectins, but perhaps some insects and insectivorous animals have not. Whatever the case, we suggest avoiding beans. Don’t gut load with too much citrus fruits. How much is “too much” depends on the situation. Dubia roaches are not sensitive to citrus, but some animals are. Be aware of this if you gut load with oranges, grapefruit, or other citrus fruits. Tomato products too. One solution may be to wait at least a day before feeding off roaches loaded with citrus. 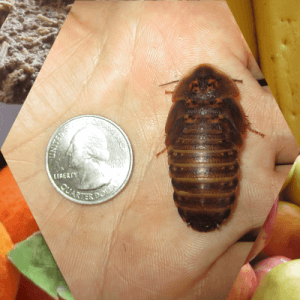 If your animals lose their appetite after feeding on citrus-stuffed roaches, or if they start losing interest in Dubia roaches altogether after the roaches feasted on anything citrus, it could be a problem. Don’t gut load with meat. Dubia roaches will eat meat, but it’s really not their thing. They prefer plants. As gut load, meat may not negatively affect your animals in a direct or significant way, but it sort of defeats the purpose of gut loading. A gut load should provide nutrients your animals otherwise wouldn’t get from the Dubia roaches themselves. They are getting all the good stuff carnivorous animals need from the roaches themselves. What is missing, and what they need from you, are nutrients they don’t get from the roach. This will most likely be things like vitamin c, plant phenols, etc. These are found primarily or exclusively in plants. Avoid dog or cat food. While probably not the worst thing in the world, we maintain the same caution for pet food as we do with meat. Yes, pet foods have “high protein”, but so do Dubia roaches. You’ve got protein covered with your feeder. Pet foods also tend to contain grains like rice, wheat, and corn. These aren’t usual gut load foods. A pet food gut load is high in protein and fat, and low in the nutrients you should be targeting. These are nutrients found in whole, natural, plant foods – not the highly processed rice or corn in pet food. The more whole (unprocessed), natural (unprocessed), plant food (not meat), the better. Pet foods can be used as a gut load if you insist, but again, we think they leave something on the table. Don’t gut load with anything rotten. This probably goes without saying. Dubia roaches can and often will eat almost anything, but this doesn’t mean they should. And your animal probably can’t eat anything and everything, so be mindful of the quality of the gut load – unless of course you’re feeding a monitor lizard, in which case it doesn’t matter and you can do whatever you want. Don’t gut load with calcium or vitamin powders. These are meant to be dusted on the insect before it’s fed to the animal. Gut loading them means you lose the ability to control the dose. There’s no guarantee Dubia roaches will eat pure calcium, for example. In fact, it’s reasonable to believe that they may avoid it altogether. Cockroaches have a known ability to eat preferentially, so it’s conceivable that they would “eat around” something like pure calcium. In fact, this seems likely. Like too little, too much calcium is not good for any animal. Gut loading should be fun. It involves some measure of creativity, you get to see the result of your efforts, and it’s an easy way to improve the health of captive insectivorous animals. In a sense, it’s a way to positively interact with your animal(s). It has the very real potential to improve their lives, which is worthwhile in and of itself. And of course, anything that improves their lives increases your enjoyment of them. While we suggest following these basic guidelines, gut loading is an area ripe for experimentation. We encourage you to try new things. However, we have a word of caution: It’s best to stay within certain boundaries. Of course, each animal and situation is different. What works in one case may not be right in another. Start with the basics, find what works for you and your animal, then branch out and test new ideas and food substances from there. As always, we’re interested to know people are doing with their gut loads. Let us know if you find something that works particularly well for your animals or your roaches! Can I feed the roaches the same gut load “green jello” stuff I feed my crickets? Would this give them all the nutrients they need without additional fresh food? Commercial gut load products typically have high amounts of certain nutrients that are deficient in the diet of common captive insectivores. They are like a vitamin pill versus a balanced diet. They are meant to be supplemental for the animal feeding on the insect rather than a complete diet for the insect. If the label says it can be used as a complete insect diet, then maybe you can try that, but otherwise we would recommend against it. Strawberries are they a no no for dubias being feed to leopard geckos and bearded dragons? I have never heard that strawberries would be a problem, either directly or as gutload for Dubia roaches. I just bought some tiny Dubias to try with my baby crested geckos. Is there a certain period of time to gut load before feeding to my gecks? Good question. The value of gut loading is typically the gut load itself, so you can feed insects to your geckos as soon as they eat the gut load. However, Dubia roaches have a unique digestive trait, which is that they digest food for as many as three days before eliminating it. This means that eating Dubia roaches that were gutloaded 2 or 3 days earlier could have added benefits for your geckos. Not much is known about the nutrient composition of two and three day-old gut load in a roach’s digestive tract because it hasn’t really been studied. However, researchers think Dubia roach digestion may unlock nutrients not otherwise available to insectivores, or transform some nutrients into others that the animal would not otherwise get or get in smaller amounts. This happens because Dubia roaches have special bacteria in their guts that other insects don’t, and these bacteria process nutrients in ways other insects can’t. If you’re interested in this, you could make a gut load available to your roaches now and start feeding them off to your geckos fairly soon – basically as soon as they’ve eaten some – but then you can keep feeding the roaches off over the course of days as they digest the gut load and produce some of those substances experts think may be so beneficial.